Four years old DASH has a tumultuous history. As to capitalization, it is now one of the top-rated digital currencies. In mid-March 2018 the market capitalization was USD 3 billion dollars. Unlike Bitcoin and other alternative currencies, the dash does not use the traditional blockchain. It has its own unique transaction system. 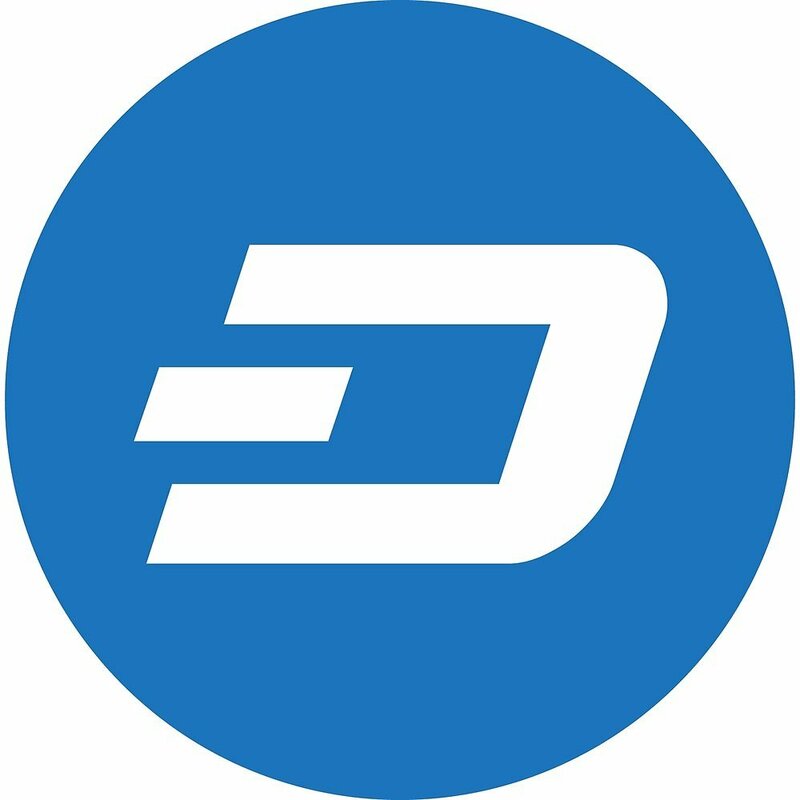 Dash was originally released as XCoin on 18 January 2014. Ten days later the name was changed to darkcoin. Finally, in late March 2015 darkcoin was rebranded to its current name. Dash stands for digital cash clearly demonstrating the ambitions of its authors i.e. to create a strong globally recognized cryptocurrency. Within the first two days after the launch, 1.9 million coins were mined, which is approximately 10% of the total supply that will ever be issued. The miners refused to re-launch the coin, instead, they exchanged the mined coins for altcoins and, in fact, initiated the introduction of the coin into circulation. The function design is based on the Bitcoin principle. Unlike Bitcoin, a dash is using a two-tier network. The first tier deals with the confirmation of transactions (through master-nodes), the second tier cares about the administration and maintenance of the server. Miners are rewarded for the maintenance (operation) of the network, not for encrypting individual transactions. A great advantage is the system’s full anonymity. A sophisticated mode PrivateSend can hide the sender’s address and the transaction history. Thanks to the Instant system, the verification of a transaction takes 4 seconds. Dash ranks among cryptocurrencies, whose value skyrocketed within a single year. While on 18 February 2017 Dash was traded at 20.05 dollars, one year later its price was USD 729.08. 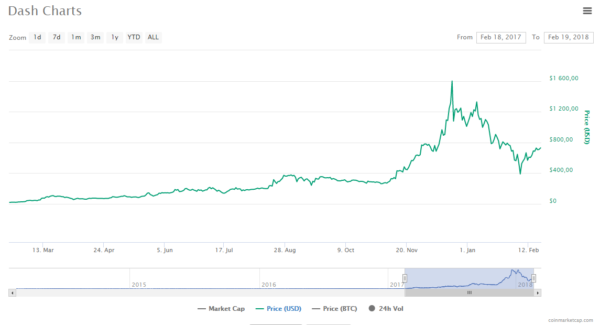 Dash reached its all-time high on 21 December 2017, when it was traded at 1 600 dollars. Within less than a year, dash realized incredible 7 980% profit. Dash is being offered by brokers offering other cryptocurrencies. One of such brokers is our well-known IQ Option, that has newly introduced a crypto exchange or, popular CFD broker Plus500. Today dash continues to be a lucrative investment opportunity. There are two ways how to get this digital currency, either by mining (which supports the overall stability of the dash network) or by buying. The mining of the leading crypto coins such as (Bitcoin, Ethereum and Litecoin) is in the hands of giant mining pools. No wonder, the process of mining requires enormous computing capacity and a cheap resource of electricity. The vast majority of mining activities takes place in China while in Europe and the USA mining is a loss-making business. The picture shows that mining in the USA does no longer pay off. In the USA, using a standard computer to mine dash is no longer efficient, as well as other cryptocurrencies and in other countries. The best way to become the owner of dash is to buy it. It’s in the portfolio of the majority of online exchanges such as BitFinex, Bittrex or Binance. If you are looking for a safe place to store your dash coins you can choose from scores of third-party applications. 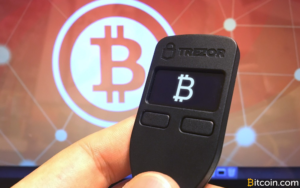 Our recommended products in this field include hardware wallets Trezor or Ledger. An official wallet can be downloaded here.